When I was checking out the map prior to my recent visit to Austria (I was flying into Bratislava in Slovenia, close to the Austrian border) I spotted a large lake in Hungary, south of Bratislava. On investigation I discovered it was called Lake Balaton. As I’ve seen quite a few cheap Ryanair flights from Edinburgh to Bratislava, I decided to do some research in Lake Balaton, with a view to visiting soon. This fresh water lake, which is 50 miles in length, is known as the Hungarian Sea, as there is no coastline in Hungary. 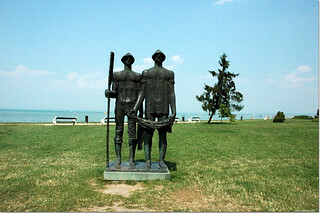 The largest town on Lake Balaton is Siofek, which offers some lively night life. There are two beaches here, called Golden and Silver. 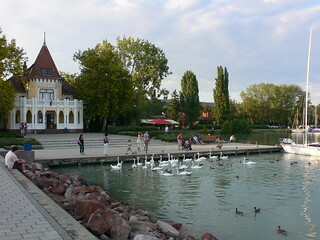 Keszthely is the second largest town on Lake Balaton. The best known attraction here is Festetics Palace. The Balatoni Museum, with exhibits about the plants and wildlife on the lake, is also in Keszthely. 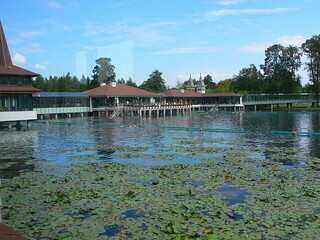 The Heviz Thermal Bath, which has naturally warmed pools, is close Keszthely. The spa’s healing powers are said to come from the slightly radioactive mud at the bottom of the pool. I must say it looks very alluring to be immersed in that warm water next to all the water lilies. As long as you only come out glowing with health? In Revfulop, you can climb up the lookout tower at Fulop Hill for some great views over Lake Balaton. 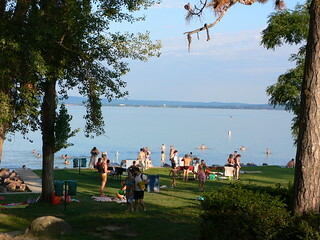 Revfulop is the starting point of the annual competition for swimming across the lake to Balatonboglar. As Balatonbloglar is the centre of wine production, perhaps the contestants are revived with some local wine on arrival?